Ford plans to make cash contributions of $5 billion to its pension plans this year, on top of $3.4 billion last year and $1.1 billion in 2011. DETROIT (Bloomberg) -- While drawing car buyers and praise from the likes of Consumer Reports, General Motors and Ford Motor Co. are getting a grip on pensions that will free up cash to develop future models. GM and Ford, burdened by some of the largest pension obligations among all U.S. companies, said this week they see significant improvement in their plans because of rising interest rates used to calculate the cost of future payments to retirees. When rates rise, the cost today of those promises declines. So pension shortfalls that were many years in the making can shrink without ever-larger payments by the companies. Over the long term, it should allow more spending on the core business and less on retirees. That in turn creates a brighter outlook for the companies, which are already delivering more competitive cars such as the Chevrolet Impala and Ford Fusion, and better-than-estimated profits. "It's one less thing investors have to worry about on the risk side," said Michael Razewski, a New York-based principal at Douglas C. Lane & Associates, which oversees $3.1 billion in assets, including Ford shares. "The less Ford has to focus on funding the pension, the more they can focus on driving innovative products and services and meeting customer demand." GM and Ford have shelled out heavily for years to try to shore up their pensions, one of their most confounding challenges. Ford plans to make $5 billion in cash pension contributions this year, on top of $3.4 billion last year and $1.1 billion in 2011. This year's payments are just shy of the $5.5 billion that Ford devoted to capital spending last year on everything from building factories to developing future cars and trucks. "We won't have to allocate as much capital to pensions as we have the last couple of years and certainly this year," Bob Shanks, Ford's CFO, said during a July 24 conference call with analysts and reporters. "That will give us the ability to take the cash that we're generating and invest it in other parts of the business that can support further growth." Ford's pension plans were underfunded by $18.7 billion last year. Only GM, with a shortfall of $27.8 billion, General Electric Co. and Boeing Co. had bigger holes at the end of 2012, according to data compiled by Bloomberg. "We've made good progress since the end of last year from a pension-funded position perspective, given the rise in interest rates that's clearly helped our overall funding position," GM CFO Dan Ammann said this week. On a conference call with analysts, he said the stronger fund "gives us more rather than less flexibility." GM isn't required to make any contributions to its U.S. pension plans this year, according to last year's annual report. The company said it expects to pay in about $900 million anyway. Both automakers have taken big steps to contain their pension costs for salaried workers. A year ago, GM said it would spend as much as $4.5 billion to shift salaried retirees to a group annuity handled by a unit of Prudential Financial Inc. The annuity, and lump-sum buyout offers to 42,000 retirees, was forecast by GM to shave $26 billion from its pension burden. 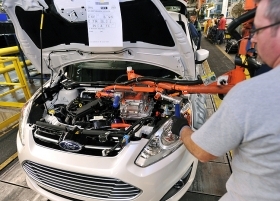 Ford is also offering lump-sum buyouts to salaried retirees. The automaker has said it wants to eliminate remaining shortfalls in its pension funds by mid-decade. For several years, GM and Ford could blame Treasury yields, a benchmark in their pension calculation, for at least part of their pension shortfalls. Yields plunged after the 2008 financial crisis as the Federal Reserve embarked on unprecedented bond-purchase programs to lower borrowing costs and encourage spending. Interest rates have risen the last two months after Federal Reserve Chairman Ben Bernanke said the central bank may reduce its asset purchases this year and stop the program in the middle of 2014 if economic growth meets policy makers' projections. The increase in rates will help reduce the funding needs at all types of pensions, whether run by corporations or governments. Detroit this month filed the largest municipal bankruptcy in U.S. history and is struggling under a large unfunded pension obligation that could lead to benefit cuts for 30,000 current and former city workers. Though shortfalls can develop in the private sector, companies have stricter funding requirements than governments and pay into a federal insurance fund. "If the year ended today, this would be the best year for funded status in the 13-year history of the Milliman Pension Funding Index," said John Ehrhardt, a New York-based principal and consulting actuary for Milliman Inc., which tracks corporate pension performance. For GM, each increase of 1 percentage point in the discount rate cuts $8.76 billion from the present value of its U.S. pension obligation, according to its 2012 annual report. A similar increase would reduce Ford's U.S. total obligation by $5.2 billion, its regulatory filing shows. Ford has seen a 70 to 80 basis-point rise in U.S. discount rates this year, Shanks said this week. An increase at the top of that range would narrow Ford's pension gap by 42 percent to $10.8 billion by the end of this year, Matthew Stover, an auto analyst with Guggenheim Securities, wrote in a report this week. By 2015, GM may reduce its pension shortfall by 24 percent to $21 billion, Ryan Brinkman, a New York-based auto analyst for JPMorgan Chase & Co., estimated in a July 15 report. The current value of promised future payments is only part of the total pension equation. The investment return is also important in assessing a plan's health. GM and Ford have said they are trying to take some of the risk out of their plans by moving to a greater mix of fixed-income assets. It's unclear whether higher rates might damp the returns on Ford's and GM's investments, said Brian Johnson, a Chicago-based auto analyst for Barclays Plc. "It depends on the extent to which they might reduce some of these long-dated bond holdings we believe they built up over the last couple years, which served them well when rates were falling," he said. Ford said this week that it expects to meet or exceed last year's $8 billion in pretax profit, helped by the Fusion family sedan, which climbed to No. 7 in U.S. can and light truck sales in the first half from outside of the top 10 a year earlier. Beating analyst estimates in its second-quarter profit, GM is riding one of the biggest waves of new models in its history. The redesigned Chevrolet Impala, among 18 new or refreshed GM vehicles arriving in U.S. showrooms this year, is now rated by Consumer Reports as the best sedan on the market -- a first for a U.S. automaker in at least 20 years. "What's so interesting about the automakers now is that they have started to really think about the business that they're supposed to be doing," Jody Lurie, a corporate credit analyst for Janney Capital Markets in Philadelphia, said by phone. "They can focus now on how to be the best in the actual business of auto-making."